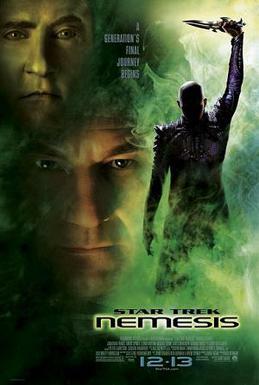 The first part of “Nemesis” is relatively good and interesting, but also somewhat unrealistic for those who crave strict in-universe logic (how could the Reman slaves convince the Romulan imperialist fleet to join their uprising?). The second part is more dragging, with the usual cat-and-mouse games inside the equally usual “nebula which makes all communication impossible”. The main actors are extremely good, so good I almost forgot they *are* actors, and the theme of the film revolves around the question “what makes us human”, with Data's android brother and Picard's clone as obvious talking points. It's intriguing that the slaves, rather than the imperial Romulan fleet, are the bad guys. Even so, I prefer “First Contact” and even “Generations” to “Nemesis” due to the dragging second half, but perhaps it looked better on cinema than it does on TV, with all the annoying commercial breaks. Three-and-a-half stars to Star Trek the Goth Generation!